The Division of Forest Health & Monitoring was established in 1921 to protect the forest, shade and ornamental tree resources of the state from significant insect and disease damage and to provide pest management and damage prevention for homeowners, municipalities, and forest land owners and managers, thereby preserving the overall health of Maine's forest resources (video). …contact an expert for help determining what is wrong with my tree or forest? 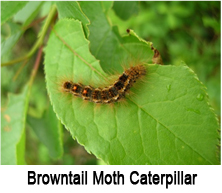 …learn more about destructive, invasive forest pests? …learn more about specific forest insects and diseases? Elongate Hemlock Scale in Coastal Maine.